A quasi-stationary cold front extended east-west through southern Arkansas (AR) and southern OK. We commenced our drive east from Giddings, TX with the aim of getting into northern Louisiana (LA) to pick up projected convection mid to late afternoon. We reached the near eastern border between TX and LA around 1pm and crossed the border between Milam and Many. During the morning and early afternoon, streets of congesting cumulus grew over eastern Texas. 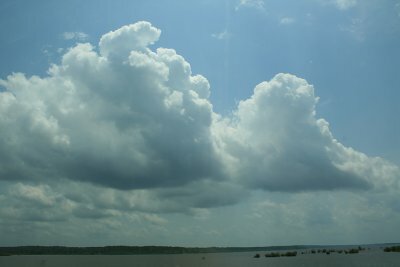 By 2pm, some towers over northern LA were reaching glaciation points and a large multicell complex appeared northeast of Natchitoches. 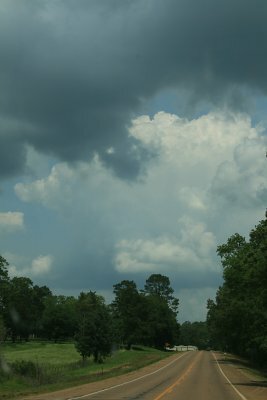 The biggest problem with stormchasing in Louisiana are the large forested areas....they obliterate half to three-quarters of clear viewing, it is a very difficult state to chase storms. 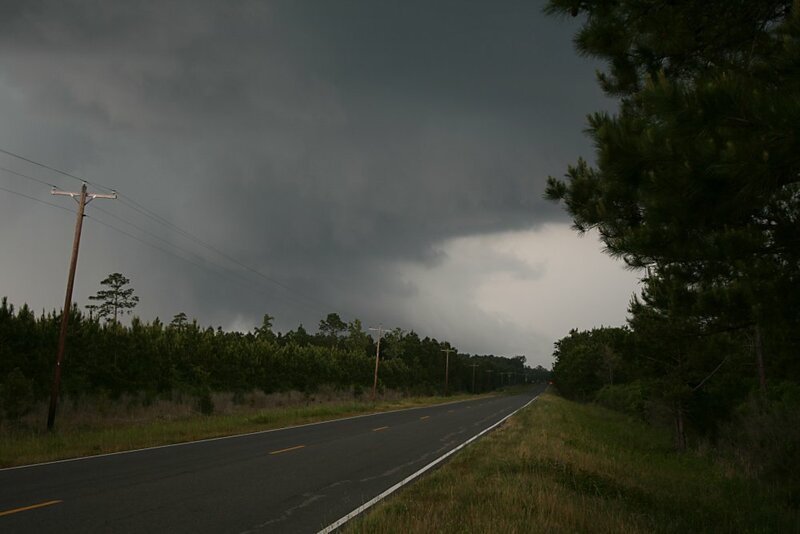 We noted several weak outflow boundaries developing south and southeast of a strengthening storm near Saline as we headed in that direction. 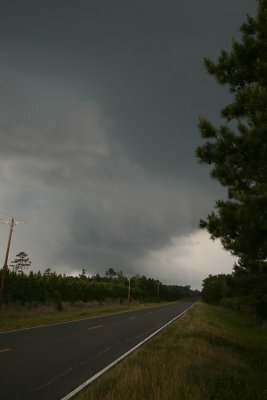 As we approached Saline, and rounded a corner, we had a limited view of a developing wallcloud. 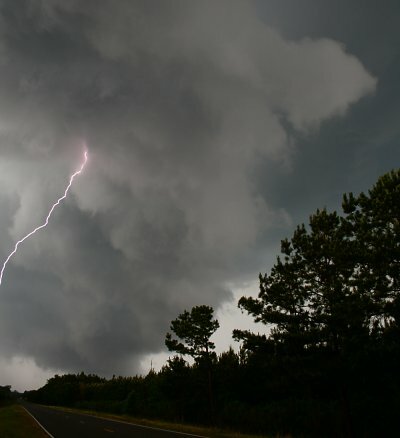 We pulled over onto grass and set our task at photographing the storm. The wallcloud was sporadically rotating (this storm was tgornado warned between 1530 and 1600) and developed an inflow tail on its northeast flank which showed rapid movement to the updraft core. The storm appeared to be wrapping rain around its western side. 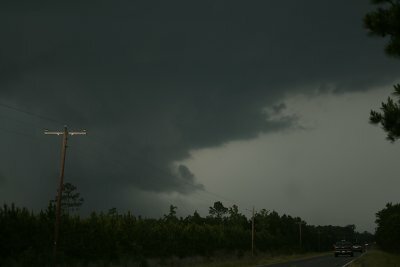 After about 10 minutes, the wallcloud became enveloped in rain and suspect the main updraft core collapsed. We packed up our gear and drove into Saline with torrential rain and flash flooding. The entire area developed into a large rain area and our day was done. 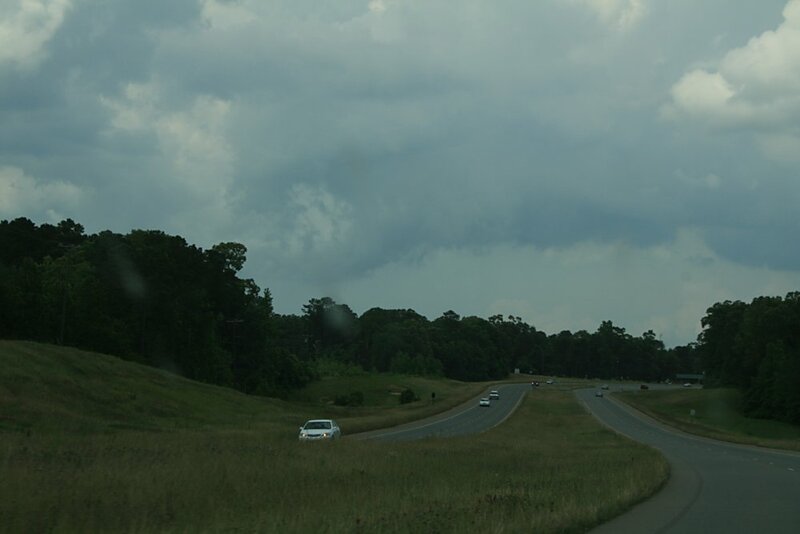 Outflow boundary, southern quadrant of a developing multicell northeast of Natchitoches.